On This Day 1918: Concert Parties from Camp delight locals. 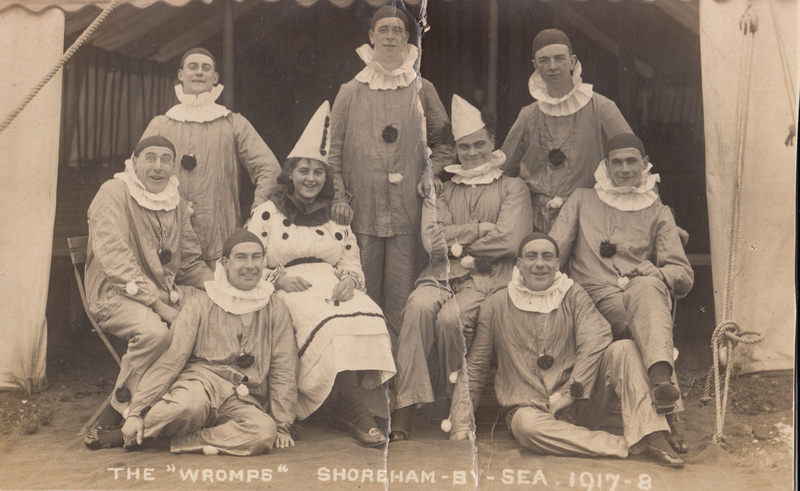 Worthing Pier declared itself “indebted” to the soldiers from Shoreham Camp for providing great entertainments. The Shoreham Camp’s London Command Depot orchestra put on special concerts that boosted visitor numbers. The Camp also provided a range of Concert Parties such as the Big Bens and Non-descripts. In May 1918 the Musiques were in possession of the Pavillion. Dressed in Pierrot costume and under the leadership of Lieutenant Richardson their very masculine performance was well-designed for popular audiences. The Wromps a Pierrot Concert Party from Shoreham Camp. Musician Sgt Stan Ward is pictured middle row far right. Previous PostMetal-detecting and mini excavation reveal clues about Shoreham CampNext PostOn This Day 1919: Saturday Cricket defeat for Shoreham Camp Soldiers.